In this particular problem, there is nothing wrong with the icemaker– it makes lots of ice. When you put a glass in the door to get ice the dispenser motor just clicks and hums but it does not start. The augur drive on the motor does not move to engage the augur so the augur does nothing, no ice thru the door or crushed ice. You can move the augur by hand so it is free and not stuck by ice or frost. If you take the augur and ice bin out and then press the dispense switch you can see that the motor has no movement, it just clicks. There is good water thru the door. The problem is probably the crush/cube selector slide switch. Common troublemaker for this problem in this model. More tips on this problem in this topic at the Samurai Appliance Repair Forums. 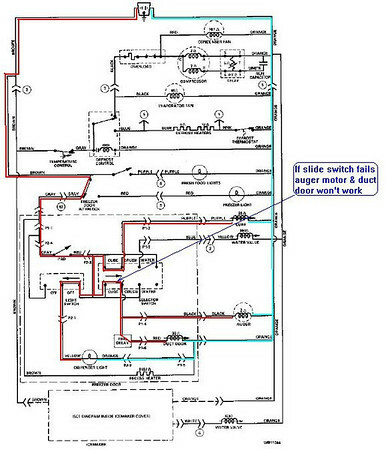 This entry was posted in Refrigerator Repair on August 30, 2010 by Samurai Appliance Repair Man.